Jill Stuart Crystal Lucent Face Powder Review | A more affordable Guerlain Meteorite powder? You know you have a good friend when they buy makeup for you while on their own vacation. Sheila is one such friend and I was thrilled when she bought the new Jill Stuart Crystal Lucent Face Powder while in Japan last year for me. Jill Stuart is an American fashion designer, but I had only ever heard of her for her makeup line, which is quite well known throughout Asia; in fact, I didn't even know she made clothes, but those are also very nice too haha. If I had to describe Jill Stuart's cosmetics, I would say it's very Japanese style, which means girly, super-pretty packaging, with sparkly, sheer washes of color and an emphasis on bright, innocent looks. The Jill Stuart Jill Stuart Crystal Lucent Face Powders came out early in 2016 and are a finely milled face powder designed to give skin a soft focus finish while absorbing excess oils and providing SPF 20 protection. There are 3 shades to choose from: natural (a matte blend of beige and soft pinks to even and provide warmth), lucent (a combination of color correcting pigments to impart a flawless glow without shimmer) and petal shower (a pink based palette that gives skin a rosy innocence). Out of the three, I chose lucent as it reminded me the most of the famous Guerlain Meteorites Illuminating Powder Compact and the color correcting aspect really appealed to me. Whose skin doesn't need a little correcting right? When I received the compact from Sheila, I had a little squeal of delight. From the gorgeous glossy box to the contents inside, Jill Stuart products never fail to give pleasure at the attention to details. The compact is housed in a silver plastic compact covered in a faceted design that mimics a crystal and it actually contains a tiny Swarovski crystal on the lid! Inside, the compact is split into 2 compartments: the first houses an interior mirror and a brush, while the second contains the powder itself. The included half-moon brush has very soft white bristles and fits comfortably in my hand. I love how it contains its own little plastic envelope to keep it clean. Usually I just chuck included brushes right away, but this one is so nice that I've actually been using it! The lucent shade contains a spectrum of colors: green to reduce redness, pink and blue to illuminate dullness and yellow tones, and pale gold and white to illuminate and add color. The powders are fairly hard packed, so swatching with a finger won't pick up much product, but I had better success using a brush. If you have dry skin, I think you could use this as your main setting powder, but for me, I use this as a finishing powder over foundation. This shade doesn't offer any coverage, but it just seems to seal in everything as a last step and gives my skin a beautiful satin and airbrushed finish. It also does a pretty good job at keeping oil at bay, although I'm fairly dry right now anyways with it being winter. Compared to the Guerlain Meteorites, I would say the Crystal Lucent Face Powder has a pretty similar effect. Both powders just smooth and gently brighten the skin. My pores appear minimized and the texture of my skin just looks different, as if it were more youthful and silky and less... just textured in general! I find these types of products super hard to describe and to photograph, well just forget that. 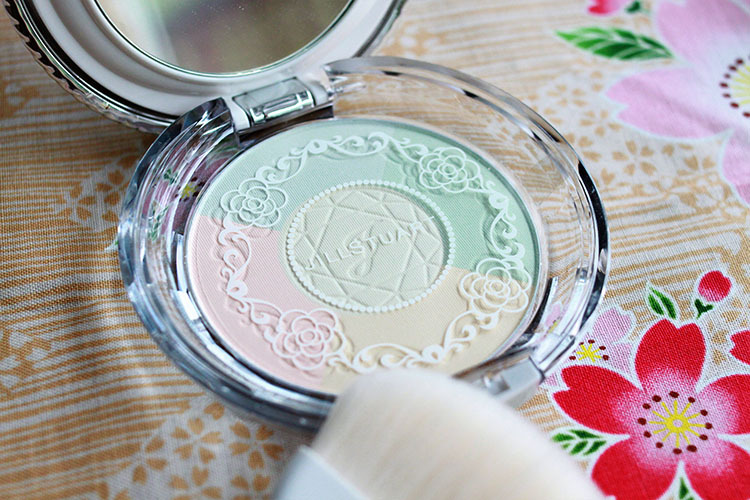 These types of powders must be tried and seen IRL to be believed. Now, I still think the Guerlain does a much better job at this where sometimes I'm just wowed by my own reflection (#narcissist), but the Crystal Lucent Face Powder is no slacker either. The Crystal Lucent Face Powder is also much cheaper than Guerlain, at $44 USD ($58 CAD) vs. $74. Neither products are what I'd call "must-have" but dang when you do see their effects, it's hard to not just say treat yo'self! Buy - I adore this finishing powder's super cute packaging and it works really well as a mattifying, yet illuminating powder that will make your skin look like you just had a facial. PS. Happy Lunar New Year this weekend! I'll be celebrating the year of the Rooster with family and a facial! Life lately: Anyone know where I can find Google Pixel phone cases that aren't super masculine and ugly looking? I've been searching everywhere it feels like and not a cute case to be found. On the other hand, this one continuously amuses me. Poor Zayn.